The 2011 college football season is a little more than two months away, but it’s not too early to start handicapping which teams have the best chance to win their respective conference and hopefully qualify for a shot at playing for a national title in the BCS Championship Game in early January. Here we will offer some college football predictions on futures betting for the BCS conferences. Starting with the ACC, bookmakers have opened Florida State as the odds-on-favorite to win the conference at +150. Next is Virginia Tech at +250, followed by Miami at +350. The Seminoles enter the second year of the Jimbo Fisher era with probably their most talented team in recent memory. QB Christian Ponder is off to the NFL, but E.J. Manual is more than capable of filling his shoes as a duel threat with both his arm and his legs. The real strength of this team could be a defense that returns eight starters, including DE Brandon Jenkins and CB Xavier Rhodes. Florida State could have a clear path to a national title game if it gets by Oklahoma in Week 3. The Big East has not placed a team in the BCS Championship Game since Miami was still a member in the early 2000s. This season, West Virginia and South Florida open as the co-favorites to win the conference at +250, but neither are expected to figure in the national title picture. The Mountaineers return eight starters on offense, including QB Geno Smith, who should be able to improve upon a very average 2010. The Bulls are coming off their third straight 8-5 campaign and appear poised to take the next step behind one of the best defenses in the country. Bookies have tagged the newest member of the Big Ten as the favorite to win the conference as Nebraska has opened at +150, followed by Wisconsin at +200. The ageless Joe Paterno and his youthful Penn State Nittany Lions come in at +375, while Ohio State’s recent fall from grace drops the Buckeyes down to the fourth favorite at +500. The Cornhuskers return 13 starters from last season’s 10-4 squad, including QB Taylor Martinez and DT Jared Crick. The Badgers lost 11 starters from last year’s team but, but they should be able to quickly reload with a wealth of talent on the roster. Look for these two teams to meet in the first-ever Big Ten title game as a result of the new six-team Leaders and Legends divisional set-up. Oklahoma is a prohibitive favorite to win the Big 12 (which now only has 10 teams because of the defection of Nebraska and Colorado) at -250. The next closest team is Texas A&M at +300, followed by Texas at +500. Bob Stoop’s Sooners are loaded this year with 17 starters from last year’s team that finished 12-2. 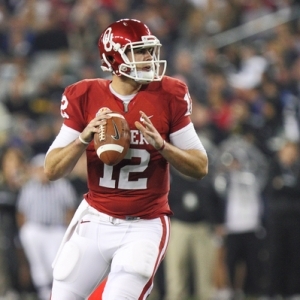 Landry Jones is back at quarterback and he will have his favorite target, WR Ryan Broyles, back as well. The defense will be led by LB Travis and DT Casey Walker. Oklahoma is not only the favorite to win its conference; it will most likely open the season as the No.1 ranked team in the country. The Pac-12 also grew with the addition of the Buffalos and Utah from the Mountain West. This conference is shaping up as a three-team race with Oregon the current favorite at +175 with Stanford and the Utes a close second at +250. The Ducks will have QB Darron Thomas and Heisman Trophy hopeful RB LaMichael James back from last year’s high-powered offense, but they lost six starters on defense. The Cardinal will have QB Andrew Luck back for one more season before he most likely becomes next year’s first overall pick in the NFL Draft. Utah lost half its starters from last season’s 10-3 ballclub, but benefits from having neither Oregon nor Stanford on its regular season schedule. It will most likely come down to Alabama (+165), Florida (+175), or LSU (+300) to try and extend the streak of SEC teams winning the national championship to six. The Crimson Tide won it in 2009, the Gators added two more in 2006 and 2008, and the Tigers earned theirs in 2007. Auburn, which won last year’s title, is not even in the top five to win the SEC this year at +1500. It’s usually a matter of survival in this conference as the last team standing gets to move on, and this season should be no different. Alabama may have the slight edge behind a defense that returns 10 starters from a unit that was ranked third in the nation in points allowed. The first test will be on Oct. 1 in a visit to Gainesville to take on the Gators and the second will be on Nov. 5 when the Tide hosts LSU in Tuscaloosa.